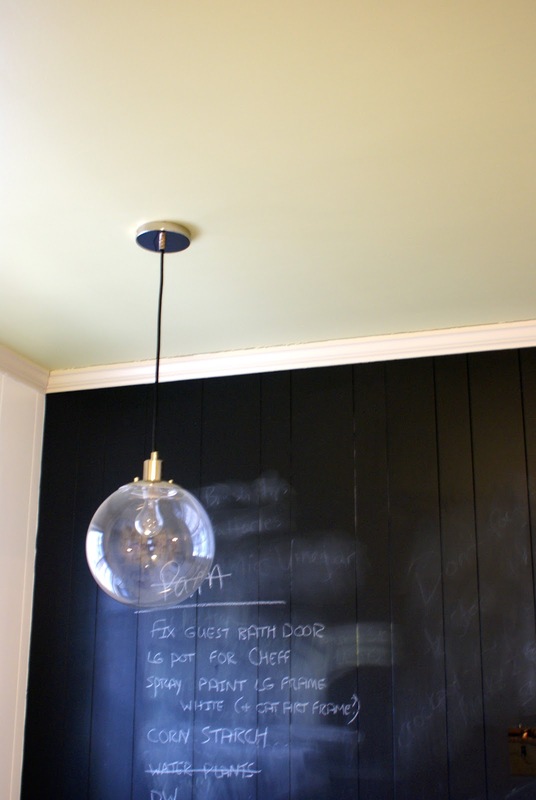 I've got a few kitchen updates to share with you today. The room is coming along and I'm quite pleased that we've I've finally made some color decisions. I have finally decided on the cabinet color. Although I absolutely love colorful cabinets, I decided it would be smarter to stick with a neutral color. I will not be painting the cabinets twice. A neutral color will allow us to switch up the kitchen color scheme in the future if we feel so inclined and the neutral cabinets will be much more appealing to buyers if/when we sell this house (we don't think this is going to be our forever home). Drumroll please.......the cabinets will be.......gray. So, with gray cabinets, light counters (possibly these), white walls, white molding and who-knows-what for the floor, there isn't going to be a lot of color going on. Due to the lack of color on the cabinets and walls, we busted out the paintbrushes and rollers last weekend and got to work on the ceiling. The ceiling? Yep. We're crazy like that. This is the picture that originally got my wheels turning. Seth and I aren't normally color-on-the-ceiling people. 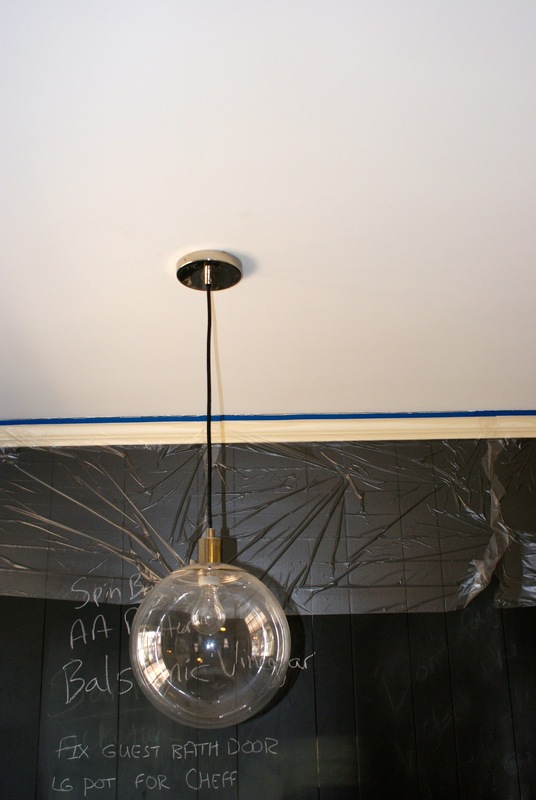 We spent quite a bit of time and energy in our first house painting the ceilings back to white (the previous homeowners had carried their wall color onto the ceilings and we changed all of the wall colors anyway). 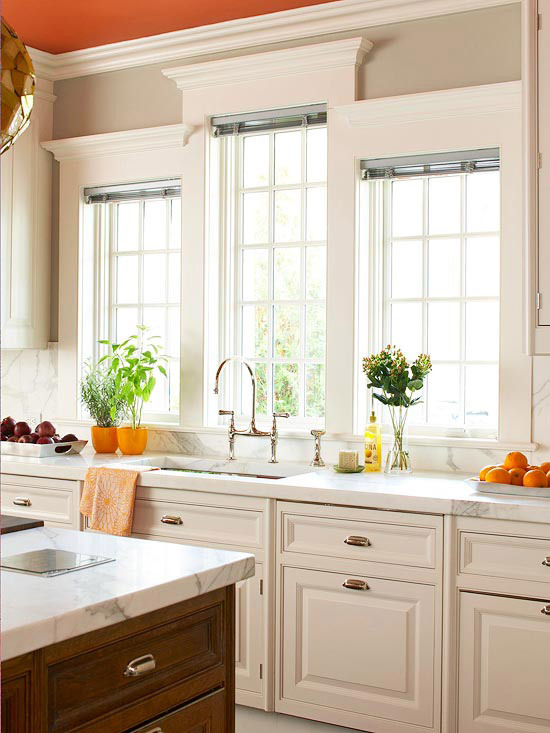 But I fell in love with this kitchen (the faucet, white cabinets, and marble countertops didn't hurt). I just love how this kitchen is neutral everywhere except for the ceiling and a few accessories. And then there is that pop of color. Delish! Weeks ago, I painted a couple of orange samples on some poster board and taped them up on the ceiling. After keeping them up there for a couple of weeks, I decided it just wasn't going to work. I'm not exactly sure why, but I think maybe they were just too dark for our small kitchen. All I know is that it wasn't right. So, we moved on to other color options. Here is where we landed. It's Benjamin Moore's Sesame (same as what's in our office). And here is a little before and after. I am liking the warmth it brings to the space. Just before we nailed down the color for the ceiling, I ordered some fabric for curtains (Braemore's Gazebo pattern in the Cloud color way). It was a bit of a splurge, but worth it in my opinion (still cheaper than purchasing most ready to hang curtains). When it came, we just made sure that the sesame was going to work with it. 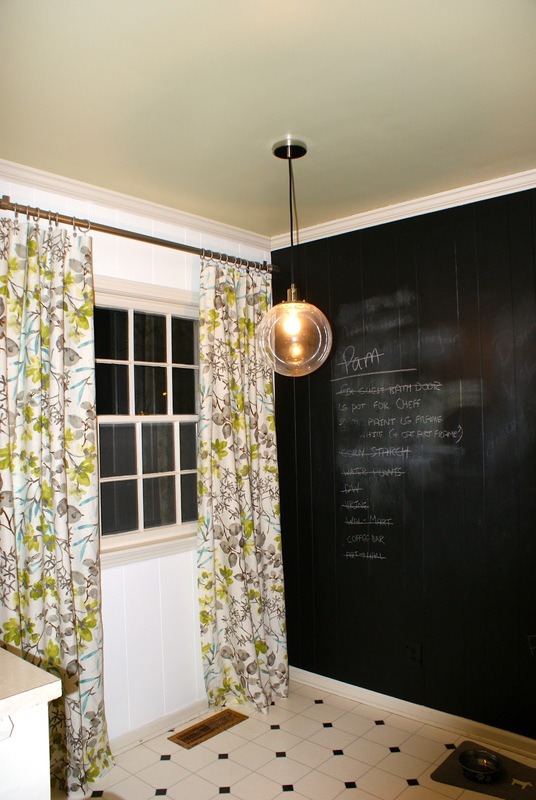 I figured it should be fine though because John and Sherry over at Young House Love (I highly recommend their amazing blog) have the same color in their kitchen and recently used the same fabric to make a faux roman shade for their kitchen window. See that here. Yesterday I washed the fabric (always do this before measuring, cutting, and hemming since it will shrink some) and got to work on making some curtains. I used some Stitch Witchery from JoAnn's and finished off three edges. I then measured to determine how much I needed to "hem" the last edge so that the curtains would just touch the floor. I'm not a huge fan of the pole pocket type curtains and I didn't feel like making tabs. So, I went the easy route and bought some curtain clips. They were half off at Lowe's! And here they are in all their glory. I purposely ordered some extra fabric in case I decide to make a valance, roman shade, or cafe curtain for the window over the sink. Time will tell. The third change is a big ugly opening that Seth made for a taller refrigerator. Pretty much all fridges these days are at least 68 inches tall. Our opening was only around 66 inches tall. We found a fridge at Lowe's that we are very interested in. I'll let you know if we pull the trigger on that purchase. (Big purchases make me a bit nauseous.) So, in anticipation of a new, taller fridge, Seth went to work on the opening with his new toy (a reciprocating saw). There was a lot of noise as I was trying to watch the Oscars. And there was a lot of dust. I worked on my curtains and stayed out of the way. I think Seth got a bit overexcited with his new saw. Men. He promises me that he will fix it and make it look nice again. I certainly hope so. We also have plans to close in the two upper cabinets that remain. I'll keep you posted. Yay for more kitchen progress! 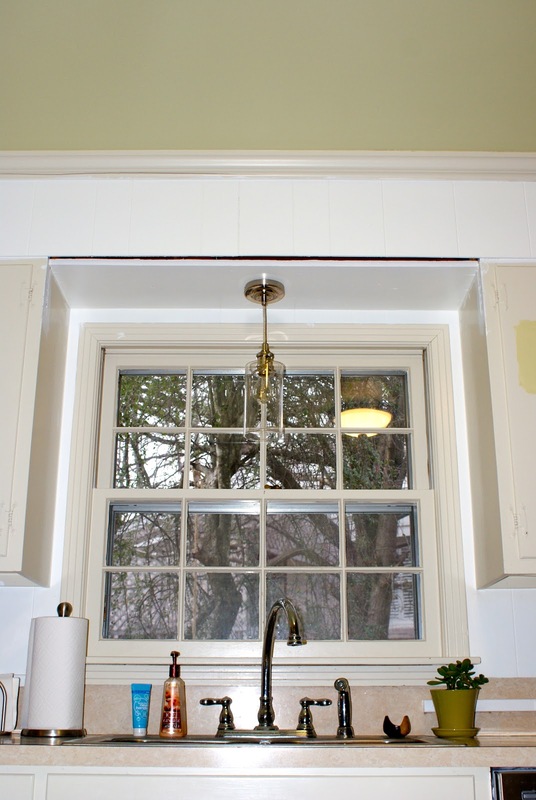 When spring decides to arrive with its warmer temperatures we will tackle the cabinet painting. I'm still dreading the work but excited about the end result. Slowly but surely, people!